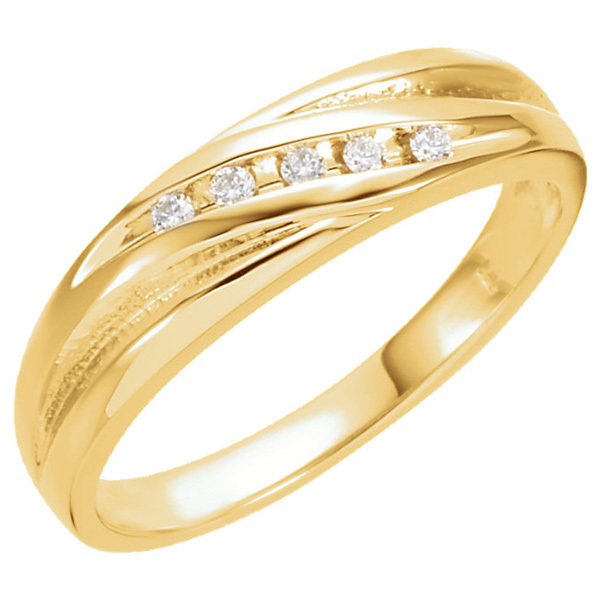 This women's 5-stone 1/10 carat diamond ring in 14K gold from Apples of Gold Jewelry is perfect for those who are looking for a lovely diamond ring to match an engagement ring or to wear along. This ring is 4mm wide and 1.7mm thick, and features an almost twist like design that has five diamonds in the center of the ring. The five diamonds total 1/10 carat (0.10 carats total), and are rated G-H for color quality and SI for clarity. There is also a matching men's wedding band available. We guarantee our Women's 5-Stone 1/10 Carat Diamond Ring, 14K Gold to be high quality, authentic jewelry, as described above.